Brace yourself, our Bourbon barrel-aged Chockwork Orange is about to clop its way into your belly. 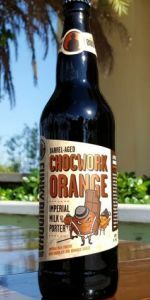 Waves of real chocolate and orange wash over your palate like a symphony of flavor conducted by a robust and roasty Imperial Porter that’s sure to make you and your droogs ready for a bit of the old ultra-yummy. Pours and sits cola brown. Smell is a dark chocolate bomb. Not a whole lot of barrel. The orange only really comes out in whisps when you stick your nose in to the glass. The taste follows the smell with strong chocolate notes on the front end, seeet in the middle, and followed by a pretty pleasant orangey after taste. Feel is silky and lightish. Overall a solid beer but needed more time in the barrel to really make it world class. Just don't know how a porter can be any more decadent and well made than this. I've had a lot of high scoring FB and this one truly tops them all so far. Light brown foamy head loaded with chocolate, orange, and bourbon bouquet. The bourbon, chocolate, and orange all are unmistakably present in the nose and palate, however increadibly well integrated and balanced. A highly orchestrated symphony of deliciousness. Mouthfeel was as or more thick and lingering than any porter I've had before, and even compared to many good stouts. Met or exceeded all expectations. Highly recommend!! Pours almost black. Sweet smells on the nose invite the drinker to pour the beverage into the mouth. Good chocolate notes on the palate with an incredibly smooth finish. I am knocking the overall rating as while the chocolate was great, I did not get any orange. Thanks for the share, Nick. This one pours a nice dark black, with a small head, and basically no lacing. This smells pretty ridiculously decadent, so much like a chocolate covered candy orange. There's also roasty malt and a hint of vanilla. I don't get much barrel on the nose. This is definitely not a barrel bomb- I get some light oak and vanilla, but not much in the way of bourbon itself. The chocolate covered orange feel to this is spot on, and surprisingly not too sweet. It's also nicely roasty, which helps keep it from being too sweet. This is medium bodied, a tiny bit syrupy but not bad. There's a normal amount of carbonation for a beer of that strength. Funky Buddha just might make the best dessert beers in the country. Tastes exactly how the description is, Bourbon soaked chocolate orange candy. Glad to have come across a bottle. Wow. Literally like liquefied chocolate covered oranges, the nose on this is amazing bourbon and orange. Taste fully follows the nose with creamy chocolate orange flavor. Funky Buddha nailed the flavor profile yet again.